Location Stock Profiles allows you to apply overrides to specific product quantities at a location. Access Location Stock Profiles in the DRP Suite in the Stock menu, select the location you wish to work with. Find the product you wish to enter the overrides for - Selecting the category will show all the styles within that category which have been allocated to a profile. Selecting the style will show all of the profiles which a)that style is currently allocated to and b) have been associated with the selected location. Selecting the profile will show the current default quantities for that product within that profile. 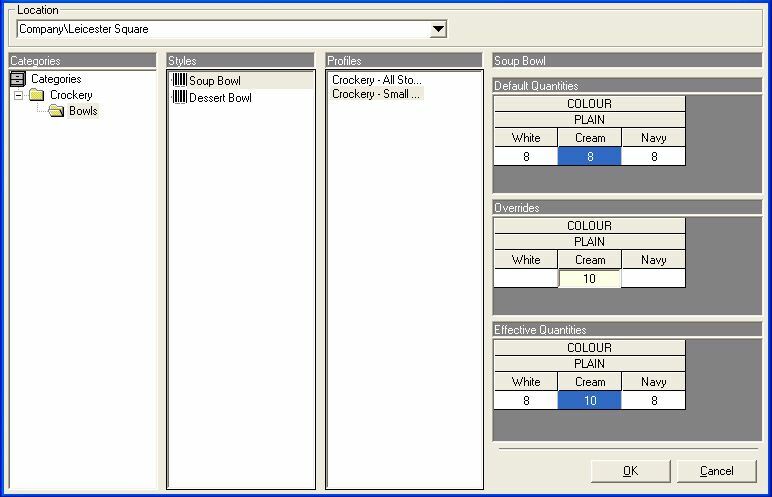 NOTE: You must amend the quantities in the profile which takes priority (See WinTill DRP - Stock Profiles), amending quantities in a profile which does not have priority will not effect any changes, this will be amended in the next release of the software so that only the quantities which take priority are displayed. Click Ok to save any changes. For a larger version of the screenshot please see the attached document.